A torque testing system is specifically the range of capacity id from utilized as a device for the quality control test or to calibrate the torque controlled tools. This comprises of electronic torque wrenches, click torque wrenches, and dial torque wrenches, electric screwdrivers, pulse tools and many more. The Torque Testing involves measuring the amount of torque that is being applied to an object. There are many common applications of torque testing out of which the most common is in fastening and in products with rotating parts like motors, engines or transformation. 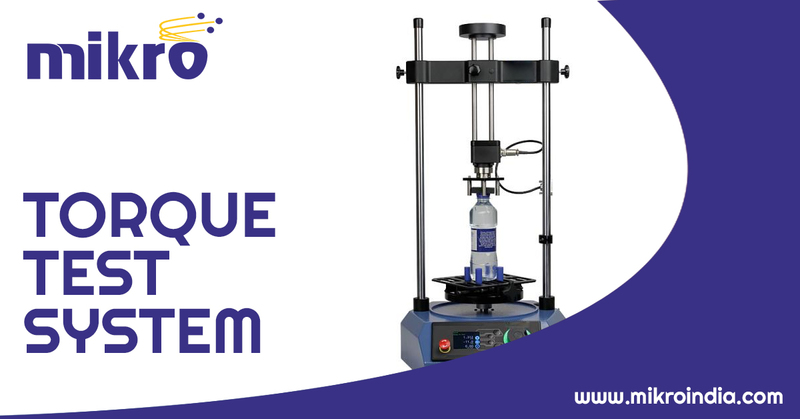 The top range Vertex-i torque testing system delivers the best optimum testing performance along with the evaluation options that enable you to get the most from your test measurements. The touchscreen torque testing system boosts the speed and efficiency of the testing on the production floor. This test system provides the ideal solution for measuring the torque that is between low and medium torque variations on the number of intricate and well-engineered products. It’s susceptibility and precise alignment makes it perfect for testing the high-quality assemblies that are found in the cosmetics, jewelry, pharmaceutical and medical industries also the finely-engineered parts that need the precision alignment during the test. It is also available as a touchscreen model with the completely same feature but at the convenience of a self-contained unit. It is completely a cost-effective solution for the straight-forward torque tests. We at Mikro Innotech pvt ltd provide all kinds torque test systems and many more services like laser marking, laser engraving, assembly line, eddy current testing equipment’s, laser micrometer etc. If you have any requirement please contact us.